﻿The applet below contains a quadrilateral that ALWAYS remains an ISOSCELES TRAPEZOID. 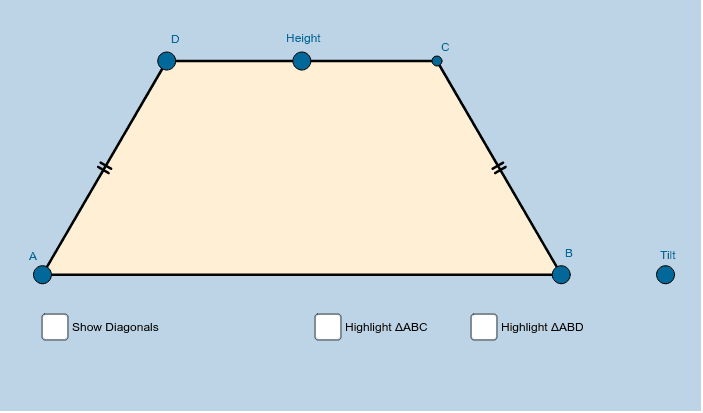 The purpose of this applet is to help you understand many of the geometric properties an ISOSCELES TRAPEZOID has. Task 4a Explain the GeoGebra command Sequence [i / n * A + (n - i) / n * B, i, 0, n] (task 4a).